Where the Sidewalk Starts: Have we lost all sense of "reason"? Have we lost all sense of "reason"? 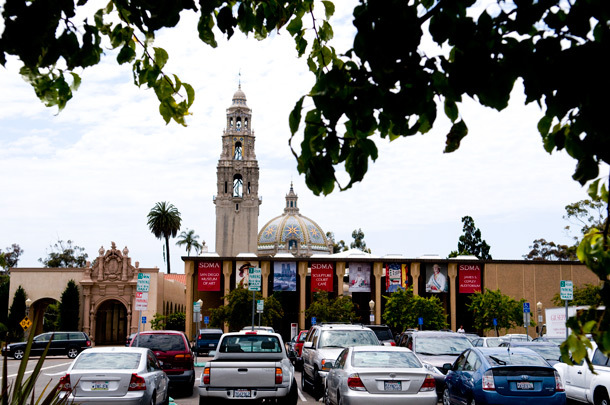 Here in San Diego there's been much moaning and groaning over a recent court decision that effectively quashed plans to remove vehicles from the Plaza de Panama in the heart of Balboa Park. 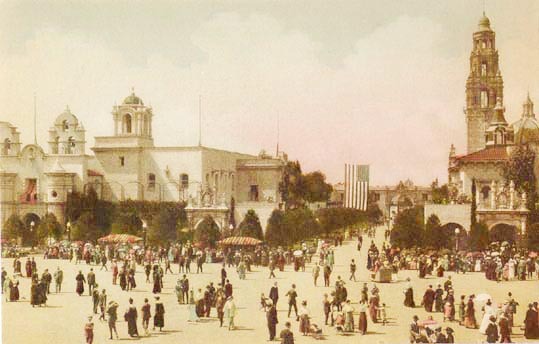 As you can see from the picture above, the Plaza de Panama was once an unobstructed square surrounded by exhibits and green space. The square is still in place today, but it's not quite the pedestrian haven it once was. After years of dodging cars to cross from one end of the park to the other, the civic-minded (and wealthy) founder of Qualcomm, Irwin Jacobs, decided enough was enough. He proposed a plan to remove vehicles from the Plaza, redirecting them to a parking lot on the park's periphery--and committed to funding it. 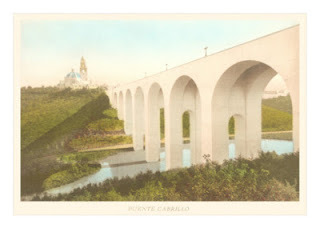 While the project had the support of San Diego's mayor and city council, the historic preservationist group Save Our Heritage Organisation (SOHO) was concerned that construction of a bypass route to the new parking lot would cause irrevocable damage to the historic Cabrillo Bridge. (Lest SOHO's claims sound too outlandish, consider the damage that previous forward-thinking planners did to the park when they replaced this bucolic pond beneath the bridge with a freeway.) They sued to stop the project, and earlier this month a judge ruled in SOHO's favor. Rather than continue the legal battle Jacobs admitted defeat and withdrew funding. There's much to be said here about big money vs. small advocacy groups, effective community outreach, true "public interest," and winning the battle but losing the war--but what grates on me is the legal technicality that lost this lawsuit. You can geek out and read the whole ruling here. In summary, the City was unable to convince the judge that there would be "no reasonable beneficial use absent the alteration" to the park. Instead, the judge found that a roadway and parking lot, while perhaps not the most reasonable and beneficial use of park space, is not entirely unreasonable. That's where I disagree with the ruling. I believe it is entirely unreasonable to sacrifice the safety, aesthetic, and connectivity of a civic institution for the convenience of park users who choose to drive there. I believe there isn't the slightest benefit to prioritizing (free!) parking over open space in a park that has ample parking elsewhere. I believe that 100 years ago when this park was built, San Diegans would have thought it crazy to use the Plaza de Panama the way we do today. There was a time when we didn't find it reasonable to place the so-called "needs" of the automobile above all our other values. It's long past time for that sort of thinking to return to San Diego.